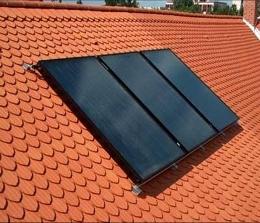 Today we will do a cost comparison of solar hot water and natural gas hot water. This is the third part of the Should I Install Solar Hot Water? series. 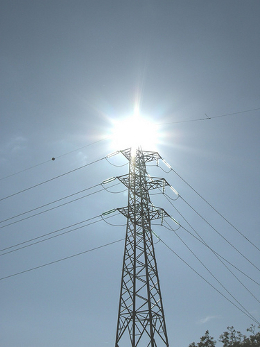 Yesterday we looked at Solar Hot Water vs Electric Hot Water. The typical solar hot water system (EnerWorks 2 panel system) we have been using in this series can produce about 2800 kWh/year of hot water here in eastern Ontario. This of course is when it’s installed in an ideal location/orientation. According to the ACEEE, a high efficiency natural gas water tank is 65% efficient at converting natural gas into heat. 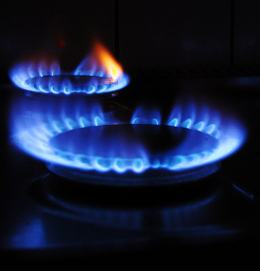 The current combined price of natural gas in Ontario is approximately $0.3022/m3. That’s $0.2354/m3 for the gas with a price adjustment of -$0.0616/m3 plus delivery of $0.1285/m3. Now, price per cubic meter is fine and dandy but we need to convert to kWh to make this easier. A quick Google search tells me that 1 m3 of natural gas is roughly equivalent 10.5 kWh (it varies but we need a number to work with). Our example 65% efficient natural gas hot water heater needs to consume 4300 kWh to produce the equivalent 2800 kWh/year that the solar hot water system can produce. And 410 m3 costs about $124 at current market prices in eastern Ontario. Therefore, if you are reducing your natural gas bill by $124/year, it will take you between 32.24 to 36.29 years to recover the costs ($4000 – $4500) of the solar hot water system and start saving real money. Over 30 years to recover the initial investment? The lifespan of a solar hot water system is only “over 20 years” which means you could easily still be paying for the thing after it’s been replaced. Of course, that is using current natural gas pricing which is extremely low. It dropped more than $0.10/m3 as of April 1, 2009 and the summer prices are usually much lower. When would it make sense to install solar hot water with a natural gas system? Using the examples above, the combined natural gas price would have to reach almost $1.00/m3 before a solar hot water system could pay for itself in 9 years. $0.50/m3 is definitely a possibility in the near future (if I remember correctly, last winter was just shy of $0.40/m3) so the payback period starts to get closer to what it currently is with electric hot water heating. Now, for my particular house, I’ll don’t think I’ll ever install a solar hot water system for domestic hot water. We have a Polaris high efficiency gas hot water tank that we use for both our domestic hot water and for heating the house. That puppy is 95% efficient. At today’s natural gas prices, it would take about 50 years to recover the initial investment in a solar hot water system. In a future post, I’ll explore the difficulty of designing a solar hot water system to augment a combined natural gas heating system like we have. This entry was posted in General, Technology and tagged energy saving, gas hot water, polaris, real world, save money, solar on 2009/05/31 by Jeff Ivany. Should I Install Solar Hot Water? Should I install solar hot water? This is a question I have been asking myself for almost 4 years now. Basically, as soon as we purchased the house I started wondering if it made sense to install a solar hot water system. The biggest reason was due to the fact we heat with hot water. I’ve spent many days and nights reading information on the internet and researching what the best options would be. I was thinking we might be able to get some added benefit out of heating with the sun. So, should I install solar hot water? This is the first post in a series. I’m trying to break up the information into more relevant chunks as I’m going to look at comparisons with natural gas and with electric hot water. You can read a lot about solar hot water online. Usually there will be claims of saving over 50% of you hot water heating costs. With the dollar savings mentioned, there is usually some great graphics about how much you are going to reduce your green house gas emissions. By using the ecoEnergy program in Canada, and with the 2009 Home Renovation Tax Credit, you can actually save $5000 (or more) off the cost of installing a solar hot water system. But, you’re still looking at shelling out around $4000 for a “typical” solar hot water system. What is a “typical” solar hot water system? Here in eastern Ontario, a typical system would be something like the EnerWorks 2 panel flat plate collector system. You can get this system installed for about $9000 but with the current rebates and incentives, that gets down to $4000-$4500. This is suitable for a typical family of 4 that consume an average of 240L of hot water per day. In this typical configuration in eastern Ontario, the EnerWorks 2 panel system can produce about 2800kWh/year of heat energy when installed in the optimal configuration (proper pitch and direction, minimal shading, etc.). This should provide an average of 60% of your household hot water needs. But solar hot water is good for the environment! Uh, it might be time for you to stop reading now. I’m not really concerned with the “green” aspects of solar heating. I’m not an environmentalist and I’ll never claim to be. I am cheap though and sometimes being cheap has “green” side effects. How much will I save with solar hot water? This is what I’m interested in. I want to know how much money I will potentially save by installing a solar hot water system. The first number I want to know is the monthly savings but the real number I want to know is how long will it take for the solar hot water system to pay for itself. What is the payback period? The lifespan of an EnerWorks 2 panel system is “over 20 years”. Well, that means we need to have the thing paid off well before the 20th year. Ideally, you want your money back in 9 years or less. Why 9 years? Well, we want the investment in a solar hot water system to payback at a decent rate. If the payback period is to large, we would have been better off putting our initial investment into a regular mutual fund, bonds, etc. The rule of 72 tells me that an investment at 8% will double in 9 years. 8% interest is pretty easy to average with decent mutual funds. So, our initial investment of $4000-$4500 in a mutual fund at 8% would be worth $8000-$9000 in 9 years. We need our solar hot water system to payback in the same time or less. If it doesn’t, we’re not making our money work for us in the best possible way. Remember, I’m looking at this from the purely financial point of view. In the simplest view, take that $4000-$4500 initial cost and divide it by 9. That gives us approximately $444 – $500/year. Therefore we need a solar hot water system to save us at least $444 – $500/year or $37-$42/month. Tomorrow we’re going to look at how solar hot water compares to electric hot water. This entry was posted in General, Technology and tagged energy saving, real world, save money, solar on 2009/05/29 by Jeff Ivany.